1. Underwear is definitely pants. This has been an issue, I believe, ever since the first writer ever worked at home. A general guideline: underwear isn’t pants. That is, you can’t tell yourself, “At least I put on pants today,” if it was just underwear — and no, you shouldn’t sign for a delivery like that. There’s no shame in working in your skivvies, though. Victor Hugo used to get undressed and have his valet take his clothes away. Be proud; just know that it’s not pants you’ve got on. Now go back to work. 2. All you need to be a writer is talent. Despite the success of many untalented writers, this myth persists. No, you need to be persistent, and writing needs to matter above other things. Most often, talent only means that you can do easily what others work hard to achieve — and this almost always means you don’t value it the way others do. You probably don’t even know how you do what you do. Talented people are often very frustrating to work with because they lack good work habits. If you find you’re talented, learn to work your tail off. And if you’re not (or don’t think you are), work your tail off — persistent people usually learn to do what talented people can do. Also, read on. 3. My talent and its demands protect me from the responsibilities of normal people. I see this a lot at writers colonies, where I get to the kitchen and someone has just left their dishes despite the ‘please wash your dish’ sign. While most people still think talent matters more than anything, in my experience, character will doom talent more than most other challenges a writer faces. Certainly, you don’t need to be a good person to write a good book, and what’s more, lots of people who write good books take advantage of others to do so — and they usually find someone who will uncomplainingly do what they will not do. Those dishes in the colony sink are usually an invitation to you to become their next little helper, in fact. Don’t fall for it! Don’t be their helper and don’t be the person who tries to get other people to do your chores. Just be a person. Do your dishes, take out the garbage, say “I’m sorry,” text people back, do some of the grocery shopping and so on. Because even if you can find someone who will do everything you require to make sure you can write and ask for nearly nothing from you in return, just watch Kathy Bates in Misery, or read Janet Malcolm’s Two Lives to see how that turns out. That little helper will punish you for it eventually. You just want to be done, which is completely different from almost being done. Usually you can’t know, though, until you get to the end. 5. When I’m not engaged in the process of writing, I’m thinking about writing, therefore I am writing. Well… most likely you’re blocked. Caveat: If you’re Edward P. Jones you may not be. I heard him speak at the Wesleyan Writers’ Conference a few years ago and he said he spent most of the years working on The Known World watching DVDs and thinking about his characters, living in an apartment with no furniture. He wrote most of it near the very end of that time after a lot of thinking. But he really was thinking about his characters, getting to know his characters. If your brain works this way, then yes, your thinking about writing counts as writing. Otherwise, write. 6. My writer’s block protects me from humiliating myself. When have I ever said this, you say. Well, this is the script in your unconscious, one you tell yourself unconsciously when you’re blocked. As such, it is usually hidden from you. If there is some idea you both cannot write about and cannot let go of, the problem is usually not with the idea. If you are blocked this way, it may be you need approval of some kind you can’t quite admit. You may fear being disliked generally, or fear the loss of approval of a parent or maybe even someone you barely remember. If you think that if you write it, it will destroy you, underneath that fear is a need for someone’s approval that you fear losing, and underneath that is you as a captive to that need for approval. 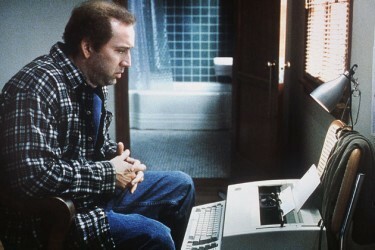 It’s not even that you have writer’s block in other words — you may have Stockholm Syndrome with your writer’s block. You may even have dressed your block up with the aura of a tragic romance, because of how it keeps you from destroying your relationship to this person who you fear would disapprove if you were to become a writer. And, chances are, that relationship (or at least, that need for approval) is exactly what you need to destroy. From here, you can go forward with one of two narratives. One is the actual book that you were thinking of and are too afraid to write; the other is a story of yourself as a complete failure. Both will be incredibly detailed and nuanced, but one will be potentially publishable while the other will only ever appear in your private theater of pain (seats one, immediate seating available). You’ve made choice number two, for now at least, and so there you sit, not writing, thinking you’ve saved yourself, your writing goals and aspirations out there dying in the wind. If this is true for you, you need to reverse the polarity — you need to make it so that you are afraid of not finishing, afraid of not getting the writing done, and that you’ve protected yourself only if the writing is done. Don’t sit there imagining disapproval instead of imagining your novel. Find out. Write it, get people to read it, send it out. And don’t just send it out five times. Rejection is perhaps the only thing writers work with more than language. Get used to it. Eat it for lunch, or maybe with lunch is better (rejection is not lunch, it’s true) and walk on. 7. I don’t care that my frenemy from grad school got a million dollars for that literary crossover novel. The good news is that a million-dollar deal really is something to wish on an enemy. It almost never works out (I refer you to Snooki, Mid-list author). Also, the literary crossover is the Bigfoot of publishing. So rarely do they appear. Whoever it is inevitably becomes The Person Who Talked About Their Bookdeal For Three Years. This person is not beloved. Also not beloved: The Person Who Talked About That One Person’s Book Deal For Three Years. Back to work! 8. I don’t care that I got a million dollars for my literary crossover novel. I’m going to just keep it real. This doesn’t change anything for me. You know. 9. I don’t need to back up my computer. 10. Publishing this book will change my life. Maybe. But usually people who believe this actually believe their debut will purify them somehow, make them into a better, more attractive person, the person they have always wanted to be. [Cue close-up, star filter, sound track] And chances are you are better off preparing for the possibility you will still be the same person with all of your bills and character flaws afterward. Some of the most desperately insecure people I know are littered in awards and achievements. What will change your life is committing to regularly producing work. More than any single opportunity, usually a commitment to writing succeeds instead. 11. I’m not going to get caught up in all that publicity stuff. This is a leading sign that you will. By which I mean, your ego is about to get dressed up and have you for lunch, marinated in sales reports, hash tags, book trailers you shot seventy times to ‘get it right’ and the climax will be you telling your publisher you’ll need one of those remote book-signing machines that Margaret Atwood dreamed up. Checking your Amazon sales rank will be the least of it, you will lie awake at night obsessing over whether and why your Twitter follower count went down, you will call your independent publicist at 12:04 a.m. to talk to her and she will say, “Uh, it’s Christmas?” You will, in other words, have a narrative about how it is all supposed to go in your head, without your involvement. This narrative is actually a fantasy, and when your book’s publication doesn’t then go that way, you’ll start to act compulsively, reaching for everything you said you’d avoid. Publishing will never be a place for publicity-phobic prima donnas again. It has undergone a tremendous transformation. You can’t afford your pose and neither can they. So get a buy button on your forehead, or one of those little squares you can attach to your iPad so you can run people’s credit cards for them, schedule a bikini wax and a teeth bleaching and get ready. Yes, I am kidding but only a little. I just mean, be a pro. You’re much better off accepting that you’ll be involved and then making decisions about your involvement so that whatever you do is at least acceptable to you. Begin at least six months before the book drops, get input from your agent and any in-house publicist the publisher pays for, and plan to be doing whatever it is you’re doing for at least a year and a half. If you are bringing in an independent publicist, get referrals from your agent and friends. 12. I’m only on social media because I have to be to promote X. No, you’re not, but also you should stop if it is true: Few things are more alienating and anti-social than an all-promotions social network presence. You become the equivalent of a sales robot at a party. 13. I’m only going to go on Facebook/Twitter/Tumblr for a few more minutes. Yes. Maybe. Or maybe you’ll find yourself there four hours later. If this is a problem, and it is for so many, schedule everything. Decide what’s acceptable and set a timer on your phone. Try internet-blocking software. Or get a typewriter. A lot of writers I know are returning to the typewriter. 14. I need a MFA. Not inherently. If you go, don’t go thinking you need to go. Go because you want to go, or because you want what it offers, which is an education in writing and the teaching of writing, time to write, money and a cohort of peers. But don’t go thinking you need to go. I think part of the backlash against the institution is that at some point people began to think it was a requirement and then to rebel against it. If you intend to teach after you publish, it can help you in situations where it is illegal for an institution to hire you without a terminal degree, which is what a PhD and a MFA are known as (they are mostly nonfatal to obtain). But for example, Deborah Eisenberg was my professor at Iowa and she didn’t get a MFA, and yet there she was, teaching us. It’s not for everyone and that’s fine. Having a MFA won’t get you published automatically, it won’t guarantee a mentor, it won’t do anything except… get you a MFA. Everything else is on you. 15. I don’t need a MFA (and no one else does either). Writing may be the only art where people are intent on propagating the myth that a studio education will ruin it. No one tells violinists not to bother with an education, for example, and a bad novel has a lot in common with bad violin playing. With talent, you might be able to just play a violin beautifully, and it would help if you’ve heard a great deal of exceptional playing. But chances are you won’t, left on your own, replicate the training that resulted in the sound you loved when you wanted to play the violin. I’ve heard the argument that other countries don’t use this method to educate their writers, but those are countries that value literature inherently. You may have noticed Americans do not. Not yet at least. If you apply, do so only after you’ve published at least a few stories or essays or poems, so that being accepted by the program isn’t the biggest thing to happen to you as a writer. Don’t begin by seeking the validation of a program, in other words — it gives the program too much power. Also: I see a lot of anti-MFA screeds that insist it is expensive, and all I can say is, apply only to institutions that have stipends available. The best ones do. With very few exceptions, the predatory MFA program run for profit is the one that has no aid packages or stipends. Other also: it seems increasingly that a PhD is now the competitive degree in hiring for teaching jobs, not always in place of, but in addition to a MFA. This strikes me as overkill in the extreme, but in any case, it is happening. 16. If you put something on the Internet, no one will read it. People will read it. But this is why so many people blog their relationships and work dramas and then get surprised by getting fired and dumped. I don’t know why people thought it would remain private while it was on the Internet, but they did, and so many do this, we must accept it’s a powerful widespread illusion. It may seem sadly obvious but in case you are just arriving to the internet for the first time this morning: Don’t, ok? Just don’t. 17. If you put something on the Internet, everyone will read it. It may sometimes be millions but probably about 300 people will read it. Personal blogging is often done badly and is usually a loss leader for writers. I do think a blog can still matter, but if the post becomes longer than 800 words, ask yourself if you should finish it as a column or essay and send it out to another publication where you can get more readers. 18. Writing for free for that website will help me get my name out there. Maybe. Find out, though. For example, is this site somehow making millions for someone other than the person writing? What is their traffic? Whenever I am asked to write for free I run the site’s numbers on someplace like Alexa before saying yes, to see if the site gets enough traffic to actually get my name out there. And if traffic is not high, ask yourself, is their small audience an audience you want? The answer may be yes. One strategy I have used is to work out how much I can write for free a year and still pay bills, and stick to it. X times a year, and then that is it. Lastly, if the site gets your work for free, it’s important to have worked out things like: who owns it after publication, how often can they use it, and so on. Don’t let writing for free be an excuse for there to be no contract on the content. This leads us to the next one. 19. I don’t need a contract for this. 20. I don’t need an agent for this. If it’s a book, you definitely do. And even if it’s not. Many agents will not send your shorter works out for you (check to see if yours does/will), but many will still glance at any contract you forward to them to make sure it isn’t crud. Either way, no one should ever do a book contract with out an agent unless they were raised by entertainment lawyers but even then, I would bet Lizzie Grubman, say, would still use an agent if she ever decided to write a book. The agent’s job is to have conversations with editors and publishers so as to know what you can’t — what an editor or publisher is actually looking for. Then, when the book is sold, the agent runs the rights under a fine-tooth comb. Do you know about bonus percentages for X number of copies sold, chances your world rights will sell, etc.? This is a lot to track. 21. My agent is ignoring me! Probably not. Your agent has, uh, other clients! This may surprise you. Your agent is not your mom. Agents are not there to be founts of unconditional love and support — don’t treat them as if they were. If your agent really is ignoring you, here’s how to tell: Is the email you sent urgent or non-urgent? That is, will you lose an opportunity if you don’t hear back, are other people also waiting to act based on the agent’s response? Did you make that plain or not? Did you actually write the email because you are insecure? Is this something you should have actually called about instead? Do you have a history of calling or writing because you are insecure instead of calling or writing because of professional things that need to happen? Answer these questions truthfully and then you’ll know. *It might still all go wrong but at least you’re honest. Alexander Chee is a novelist, short story writer and essayist, and contributes to The Morning News, Paris Review Daily, Granta, NPR Books as well as The Awl. He lives in New York and blogs at Koreanish.